You will see a standard processing window, where you can see "Compiling" and "Linking" stages. See also: Compiling your project with EurekaLog. It indicates that EurekaLog is active, enabled and doing post-processing of your executable. 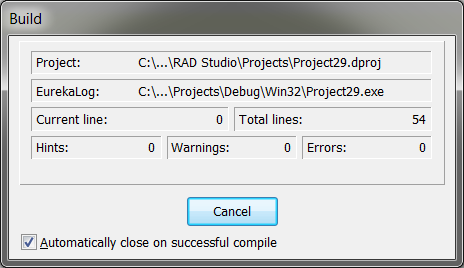 If you don't see this post-processing stage and/or IDE messages output is empty - then something is wrong. 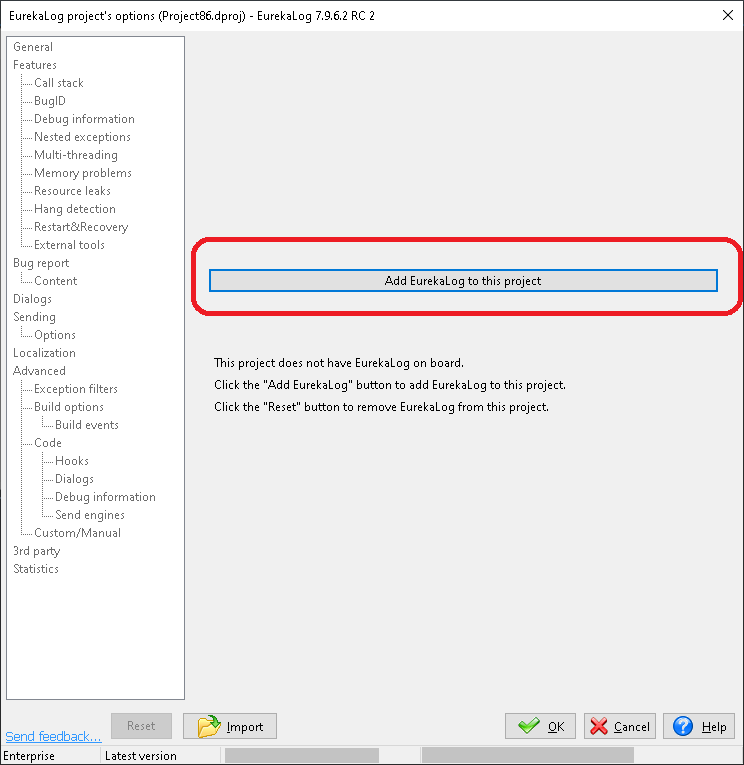 You have dropped TEurekaLogEvents component on the form but did not enabled EurekaLog for your project via "Project" / "EurekaLog Options" menu. TEurekaLogEvents component is supposed to react on EurekaLog's events, but it does nothing if EurekaLog is not added. Please, enable EurekaLog for your project as explained here. 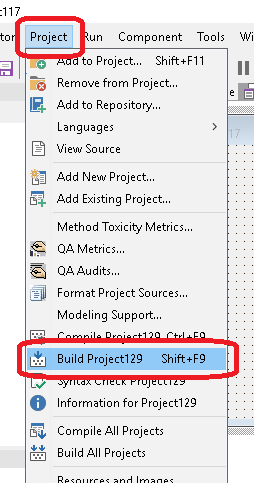 You should find it into "Components" \ "Install packages" IDE menu. If EurekaLog IDE Expert package is disabled - enable it. 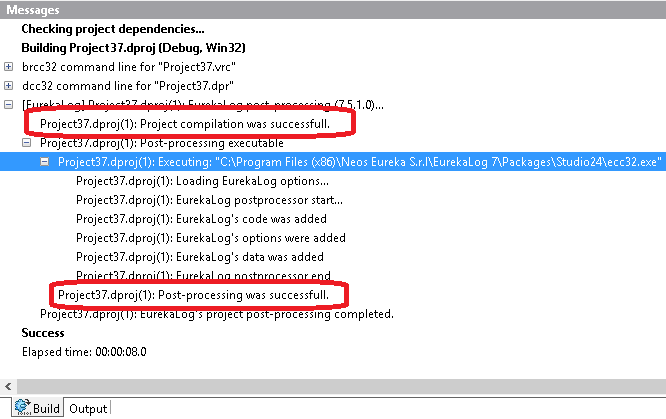 If it's not even there - click on "Add" button and pick EurekaLogExpert.bpl package from \Packages\IDEName\ subfolder of your EurekaLog installation. Replace IDEName with your real IDE version. Use IDE name mapping to determinate which folder corresponds to your IDE. 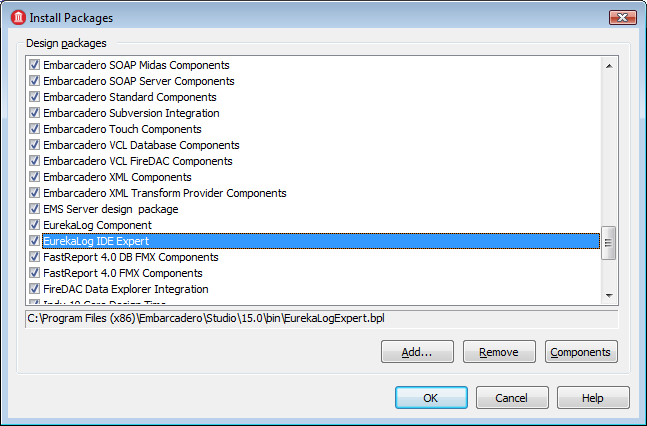 If you can't find EurekaLogExpert.bpl file - then you need to reinstall EurekaLog and make sure that you have selected support for your IDE during installation. Please, follow these guidelines. Please, follow these guidelines. Make sure to apply proper application type for your project! Once you've checked and verified both items - make final confirm that EurekaLog was really injected into your executable.